What if we told you that you never have to maintain or unclog your gutters again? In our last article, we discussed when you should consider a new gutter system and the consequences of a poor installation. Many homeowners inherit the decisions of builder (new builds) or previous occupants (resale) and have to face the inconvenience of managing a gutter system that’s not quite broken, but not ideal. Alu-Rex has developed an incredible solution specifically designed for this group. Gutter Clean is a Leaf Guard that is installed on top of your gutter system. With its sturdy aluminum construction it is strong enough to support the weight of snow and debris while reinforcing the integrity of the entire gutter system. The Gutter Clean System leaf guard comes with perforations of 7/64” (2.8 mm) in diameter that can drain 29.7” (754 mm) of water per hour. It is made of 0.017” thick gold-plated aluminum with a length of 7.44’ per segment. The MC-5100 model is made of copper and the M-63ZIP model comes in segments of 10’ in length. The PVC used is UV resistant and recyclable. Chinook Exteriors partnered with Alu-Rex to offer our customers both the t-rex (new gutter systems) and gutter clean (existing gutter systems) because we love the company’s standards and best in class product warranty. Ideally, every new system should be a t-rex. It speaks to all the criteria referenced in our article THE IMPORTANCE OF PROPERLY INSTALLED GUTTERS AND WHEN YOU SHOULD CONSIDER REPLACING YOUR SYSTEM. What’s exciting about gutter clean is that the product allows you to retrofit many of the t-rex’s best practices into an existing architecture. Of note: Alu-Rex guarantees its product with a 40 year CLOG FREE warranty. 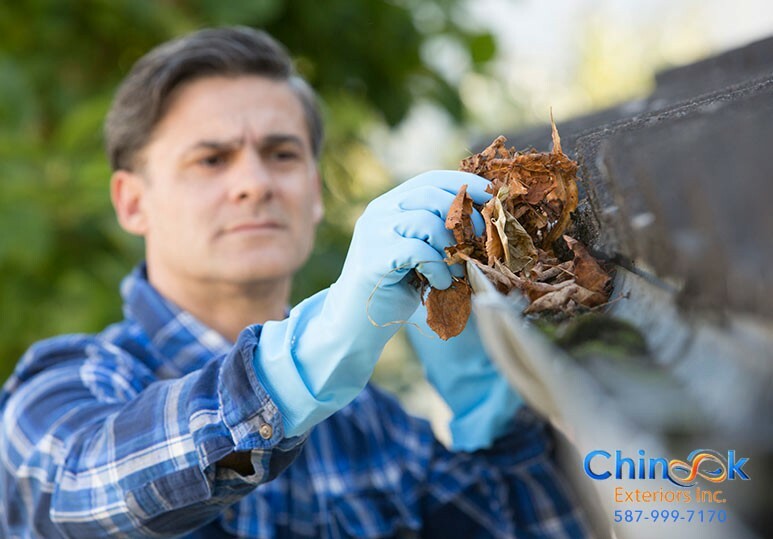 Leaves, debris and ice will never clog your eavestroughs. This means preventing expansion.contraction (snow in the winter) and water infiltration (summer). Prevents overflow from the rain gutter (roll back technology). Does not rust, crack or warp and maintains the structural integrity of the entire system. Keeps insects (and their eggs) out by preventing stagnant water. Considering gutter clean for your home. Chinook Exteriors has already installed gutter clean for dozens of Calgary homeowners. Call us today with questions or for an estimate.